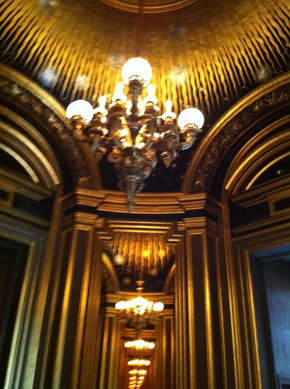 In 1669, Louis XIV founded the Opera in Paris. 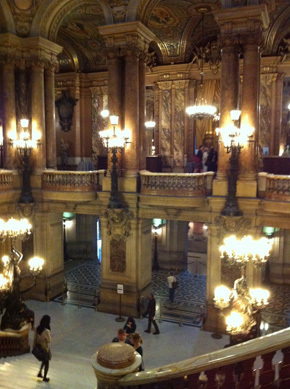 Today you can tour the most opulent Opera House designed by Charles Garnier in 1860 on the order of Napoleon III during the great Parisian reconstruction project orchestrated by Baron Haussmann. 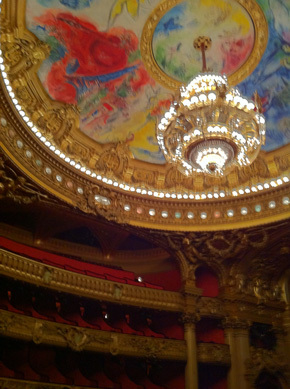 The Opera House took fifteen years to complete and was inaugurated on January 15, 1875 as the “Palais Garnier”. The grand staircase was created in various colors of carved marble with two bronze statues of large female figures holding ‘bouquets of light’ at each side of the entrance. The Grand foyer has huge mirrors and windows reflecting sparkling mosaics –making the entire room magical. The painted details and the sculptures are overwhelming –one can imagine the elegantly dressed audience, of days gone by, drinking champagne. Marc Chagall’s colorful painted ceiling with an enormous crystal chandelier hanngs in the center of the red velvet and gold auditorium —just magnificent!